The lovely folks at Sparkly Soul sent me a couple of their headbands to try out for you guys several weeks ago and I’ve been wearing them religiously to Crossfit ever since. Nothing like a sparkling blingy headband for a 6am WOD to wake everyone up! I love these things! They are made of a really plush velvet with sparkle on the outside and velvet on the inside. 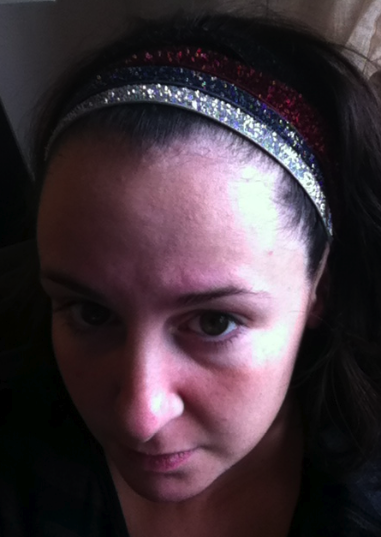 I’ve found I can wear the sparkly side out or reverse the headband and wear the velvet side out. The sparkle side still has a velvety feel to it so it still grips your head without pulling at your hair. They stay on my head for the entire workout without needing adjustments or fussing. I have a pretty narrow head so I have issues with headbands flying off, migrating back and just overall not feeling firm enough on my head. These ones feel firm on my head without feeling tight. They come in two sizes 3/8 inch and 5/8 inch. I liked both sizes and couldn’t decide which one I liked better. My favorite ones are the black which came in the thicker band and the dark grey which came in the thin. To wash them you just rinse them in cold water and hang to dry. 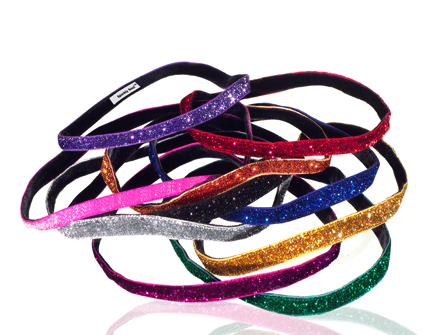 Sparkly Soul would also like to offer a lucky reader one thin and one wide headband. To win you have to follow me on twitter @lulumumblog and follow @sparklysoulinc, and leave a comment here letting me know what sport you’d like to wear your headband to. If you aren’t on twitter, no bother, just follow me on facebook (link on blog sidebar). Make sure to leave me with a way to contact you. Contest closes November 22, 2013. Make sure to enter, these things are awesome! Excuse my weird picture, these are the 4 colors I got. "Review: What The Fluff Line (Pullover, Vest and Jacket) Laceoflage Free To Be Tankww"